Czechoslovakian teenager Alena Synkova penned the poem, “I’d Like to Go Alone,” while confined at the Terezin (Theresienstadt) concentration camp, a ghetto in the hills outside of Prague that was home to 15,000 children between 1942-1944. Synkova was one of fewer than 100 children who passed through Terezin to survive the Nazi genocide. Her poignant poem and other drawings and poems created by the children of Terezin are compiled and preserved in “I Never Saw Another Butterfly”, first published in 1959 for the State Jewish Museum in Prague and later published in the United States in cooperation with the United States Holocaust Memorial Museum in Washington, D.C. Using a grant she received three years ago to support Holocaust education, Central School Reach teacher Jill Zimmer purchased a classroom set of “I Never Saw a Butterfly” and, working with Grade 5 teacher Jennifer SanAntonio, the two came up with a powerful fifth grade language arts unit. When I visited the Memorial Site at the former Majdanek camp, I was surprised to see all the artwork on display; there were sculptures and lots of other artwork that had been done by the prisoners in the camp. I remember a rosary that had been fashioned out of bits of bread that had been wadded up and left to dry to make the beads. I did not see the butterfly pictures, but perhaps they had been taken to another Holocaust Museum in America or Israel for display. The children in the Theresienstadt (Terezin) concentration camp were allowed to do artwork and they were even given lessons in drawing and painting by an adult teacher. Some of their pictures were on display at the United States Holocaust Memorial Museum in Washington, DC when I visited there years ago. But to get back to the “Nazi monsters.” Hitler was an artist himself. Is that why he allowed the children to draw or paint butterflies before they were killed in the gas chamber? Hitler may have thought that he was being kind to the innocent children by allowing them to paint butterflies before dying, but I think this was unnecessarily cruel. It gave the children hope, when there was none. The photo below is at the top of the news article. This huge monument is very near a major highway which goes past the former Majdanek concentration camp. Gutter is right about that. That’s why his trip to Majdanek, and the horrific experiences he recounts in the camp’s barracks and crematorium, are being preserved with virtual reality—thanks to the USC Shoah Foundation. You look out the window and you see two identical buildings, so you say “Which one?” Your guide tells you that the gas chamber is the building on the left, and that the identical building on the right was used for delousing the clothing of the prisoners. You are appalled! Little girls playing outside, while, a few yards away, Jews are marching into gas chambers to be killed. That’s when you begin to understand that the Nazis really were the worst people in the world. Was carbon monoxide used at the Majdanek concentration camp to kill prisoners? In the comments section of my blog, a reader put up a photo which showed the remains of bodies that had been burned. The photo that was put up on my blog showed only the bottom portion of the photograph above. The burned bodies in the photo above were pulled out of the ovens by the Soviet soldiers who liberated the Majdanek camp after the Germans had left. The Soviets claimed that the Germans had burned prisoners alive in the ovens. The black and white photo above shows the ruined crematorium as it looked when Russian soldiers arrived at the camp on July 23, 1944. The wooden crematorium building had been set on fire by the Nazis in order to burn the bodies of Polish political prisoners who had been brought from the Gestapo prison at the Castle in Lublin and executed the day before liberation. Their charred remains are shown in the foreground in the photo. In the background, of the photo, are the brick ovens with iron doors which were not damaged in the fire. The main gas chamber building, which is located down the slope at the other end of the camp, was not burned, leaving behind ample evidence of the Nazi crimes. In another room of the crematorium building is the concrete dissection table, on which the bodies were examined for valuables hidden in body cavities, according to the tour guide. It was here also that the gold teeth were removed from the victims after they were gassed. After the camp was liberated, bones of the cremated victims were gathered and put on display in a glass case, according to accounts written by visitors to Majdanek. I didn’t see any glass case, but there was a large closed casket on display in the crematorium. The casket was covered with funeral wreaths, bouquets of flowers and candles left by visitors. The tour guide pointed out a new memorial plaque, placed at the crematorium in 1998, which had upgraded the percentage of Jewish victims in the Majdanek camp to 48%. The former number was 41%, which is mentioned in the guidebook. During the Communist regime in Poland, the suffering of the Jews was downgraded and the martyrdom of the Poles was emphasized. Now that is slowing changing to reflect the greater suffering by the Jews. Of the remaining victims, 31% were Polish political prisoners, 16% were POWs from the USSR and 5% were POWs or political prisoners from 26 other countries, according to the Museum booklet. Although most of the prisoners were either Jewish or Christian, there were also a few political prisoners in the camp who were Muslims or Buddhists, according to the Museum booklet. The correct way to write about the former concentration camps in Poland is this: “former NAZI concentration camps in Poland”. This news article insinuates that the former camps for Jews, located in Poland, were camps run by the Polish government, not by the German government. The Polish people hate when that happens. Please get it right! The bad guys were the German people, not the Polish people. The word impactful will not go through a spell checker, which indicates that this is not a word in the English language. Tracey Filben said the experience was rewarding but emotionally draining. She added the trip included visits to Auschwitz, Majdanek and Treblinka concentration camps, along with the Warsaw ghetto, Oskar Schindler’s factory in Krakow and several Jewish memorials. I highly disapprove of these student trips, on which today’s young people are taught to hate the German people. My photo above shows a window in one of the gas chambers at Majdanek. At least, the Germans were nice enough to put a window in one of the gas chambers at Majdanek, so that the Jews did not have to die in a room with no light. You might think that a glass window should not have been put into a gas chamber because the Jews could have broken the window and climbed out. Actually, this window was very high on the wall, and the Jews were mostly short people. One aspect of Majdanek that stood out to me was that there was a town overlooking the camp. 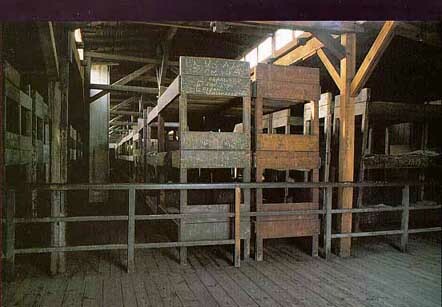 People’s balconies looked out to the gas chambers and the barracks in which thousands of people were imprisoned. It is mind-boggling to me how people can wake up, make coffee, and sit on their balconies and welcome in the morning by staring death in the face. I never thought I would experience a place that could prove to be more emotional than Auschwitz. I thought I had experienced the worst of the worst while at Auschwitz-Birkenau, but when I went to Majdanek, I proved myself wrong. One of the first places that I visited, when I began touring the sites of the Holocaust, was Majdanek. I was very impressed by the sight of the Majdanek camp, but not for the same reason that this young girl was impressed. When I began my tour of the camps in Poland in 1998, the first place that I visited was Treblinka. In sharp contrast to the alleged extermination camp at Treblinka, which is in a wooded area as remote as Ted Kaczynkski’s Montana cabin, the Majdanek concentration camp is situated in a major urban area, four kilometers from the city center of Lublin, and can be easily reached by trolley car. The location of the Majdanek camp is in an area of rolling terrain and can be seen from all sides; it could not be more public or accessible. Besides being bounded on the north by a busy main road, the Majdanek camp was bounded on the south by two small villages named Abramowic and Dziesiata. According to the camp guidebook, Heinrich Himmler ordered the liquidation of the Jews in the Lublin district after the insurrection on October 14, 1943 at Sobibor, one of the Operation Reinhard extermination camps on the Polish-Russian border, in which 300 Jews, led by a Jewish Russian Prisoner of War, escaped into the nearby woods. At that time, the three largest concentrations of Jews in Eastern Poland were at the camp at Majdanek and at the labor camp at Poniatowa, a tiny Polish village where 18,000 people were held, and at the Polish village of Trawniki where 10,000 Jews were imprisoned in a labor camp. 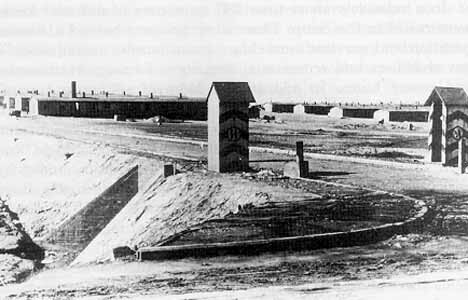 People driving past the camp, while it was in operation, had a completely unobstructed view, being able to see the tall brick chimney of the crematorium wafting smoke from the top of a slope not far away, and the gas chamber building which is a few yards from a busy street. Majdakek is also known as Maidenek, which is the German version of the name. What really impressed me, when I visited the Majdanek memorial site was the huge stone monument at the entrance. The population of Lublin has more than tripled since the end of World War II and the former Majdanek concentration camp is now within the city limits, like a municipal park except that it is a ghastly eyesore. There are several modern high-rise apartment buildings overlooking the camp on two sides. On one side of the camp, is a Roman Catholic cemetery which was there even when the camp was in operation. On the other side of the street, directly across from the former concentration camp, there is now a Polish military installation since this street is part of the main road into the Ukraine and Russia. During World War II, the street which borders the Majdanek concentration camp was the main route to the eastern front for the German army. The city of Lublin is near the eastern border of Poland and what is now the Ukraine. Between 1772 and 1918, when Poland had ceased to be an independent country and was divided between Prussia (Germany), Austria and Russia, Lublin was in the Russian sector. In April 1835, Russian Czar Nicholas I issued a decree which created the Pale of Settlement, a territory where Russian Jews were forced to live until after the Communist Revolution of 1917. Lublin was located within the Pale of Settlement, as was the city of Warsaw. The census of 1897 counted 4,899,300 Jews who were crowded into the Pale of Settlement, which was like a huge reservation similar to those where the Native Americans were forced to live during the same time period in the western USA. In 1881, Russia began evicting the Jews from the Pale, which began a mass migration. By 1914, two million Jews had left the Pale and had settled in Germany, Austria, America and other countries. In 1939, when Poland was again divided between Germany and the Soviet Union, Lublin came under the control of Russia again. This lasted until June 1941 when the Nazis launched an attack on the Communist Soviet Union, the ideological enemy of Fascist Germany. Lublin, being close to the border of the German-controlled General Government of Poland, was one of the first cities to be conquered by the Germans. The German conquest of the Soviet sector of Poland in the last 6 months of 1941 brought Polish Communists and also millions of Jews, who were the sworn enemies of the Nazis, under the control of the Germans. 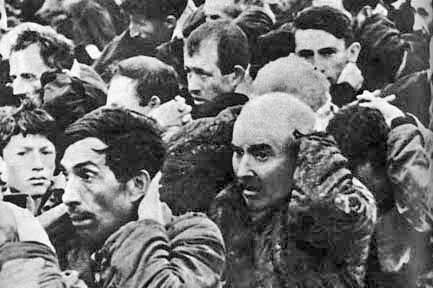 In order to avoid having partisans attack them from the rear as they advanced into Russia, the Nazis rounded up those whom they considered their political enemies and confined them in the Majdanek camp, along with the captured Soviet POWs. But, to get back to the apartment houses, with their balconies overlooking the camp, I did not photograph them because I did not want to invade their privacy. However, my tour guide did point out the balconies, as she told me about the Polish residents watching as the Germans shot thousands of Jews at Majdanek. The gas chambers at Majdanek are on the other side of the camp, near the highway, where thousands of vehicles were passing by. People could observe the Jews entering the alleged gas chamber building. The Nazis claimed that the Jews were only taking a shower, not being gassed to death, in this building. The identical building right next to the gas chamber building is closed to tourists. The clothing of the Jews was disinfected in this building, in order to kill the lice that spreads typhus. I am on Bradley Smith’s mailing list, and today I got a message from him directing me to his latest article on the internet. In his latest article, Bradley writes about Rafi Farber and an article which Mr. Farber wrote. What’s wrong with Bradley! Of course Rafi Farber believes in the gas chambers at Majdanek. Wow! I actually got a Holocaust denier to comment here! That’s a strange accomplishment. I am building bridges I’m not sure I even want built. Surely those who disagree with me will cite this as evidence that I have “gone too far”. Yes Bradley Smith. I “believe the gas-chamber stories”. I am a Jew whose extended family was murdered in the gas chambers. And I physically visited the gas chambers and saw the 17-ton pile of human ash at Majdanek filled with my family who died there in the gas chambers that I was physically in. Those Jews who are reading this who want to know where I’m drawing the line, it’s here. This guy is on the other side. Do not comment here again, Mr. Smith. I am sorry that I have to disagree with Rafi Farber and cause him more pain. The ashes of his family are not in the 17-ton pile of human ashes at Majdanek — unless he has family members who were fighting as illegal combatants, aka resistance fighters, in World War II. 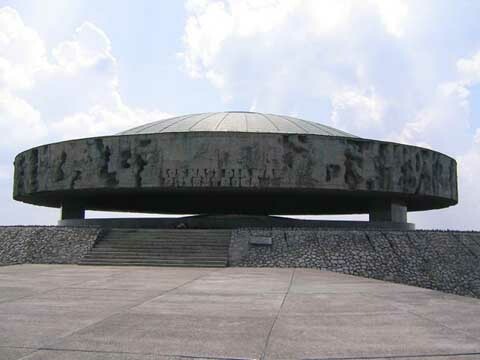 A gigantic, circular Mausoleum at the Majdanek Memorial Site [shown in the photo at the top of this page] stands at the end of the former “black path” to the crematorium, a walkway that is now called the Road of Homage in English. The structure was designed by architect and sculptor Wiktor Tolkin, the same man who designed the Monument of Struggle and Martyrdom at the other end of the walkway, near the street. Under the dome is a huge circular urn, shaped like a saucer, which contains the ashes of some of the victims who died at Majdanek. Before visiting Majdanek, I had heard about the ashes and wondered what kept them from blowing away in the wind. The answer is that the ashes were recovered from a compost pile in the camp, where they had been mixed with dirt and garden refuse and composted in preparation for spreading on the vegetable garden in the camp. The material under the dome looks like compacted dirt; it is the color of adobe. There are a few bone fragments visible. To the left, in front of the steps, are four containers to hold eternal flames for special ceremonies. Also to the left, as you face the dome, is the very inappropriate location of the toilets, which are underground but have air vents sticking up, that look like some weird sculpture. The first thing that the tour guides explain to Americans is the toilet etiquette in Poland. In many places, including the camp at Majdanek, one must pay an attendant on duty to use the toilets. Bring your own toilet paper because there is usually none available, even though the charges are supposed to pay for the cost of the paper. The toilets are for both sexes and there is no door on the men’s facility. When I visited the camp, the toilets were unbelievably filthy, just like at the Auschwitz II camp at Birkenau. The photograph at the top of this page shows the Mausoleum. To the right of it is located the reconstructed crematorium building. Standing on this spot, you have a panoramic view of the camp below you. Behind the Mausoleum are new modern apartment houses, their balconies painted red, yellow and blue, resembling buildings made with children’s colorful building blocks. As you are standing in front of the Mausoleum facing the camp area, to the left there are more apartment buildings in the city of Lublin. To the right, as you face the camp area, is Lublin’s main Catholic cemetery which borders the camp; this cemetery was being used when the concentration camp was in operation. There are noisy black crows flying overhead, which the tour guide says are always present here, as if to give further warning to visitors. At this time, the three largest concentrations of Jews in Eastern Poland were at the camp at Majdanek and at the labor camp at Poniatowa, a tiny Polish village where 18,000 people were held, and at the Polish village of Trawniki where 10,000 Jews were imprisoned in a labor camp. The Nazis also feared that their plans to exterminate the Jews were being thwarted by the cooperation of the camp resistance movement at Majdanek with the Polish underground organizations fighting as partisans outside the camp. The Memorial Site guidebook devotes a whole section to the activities of the camp resistance movement, which included activists from the Polish Home Army, and the main political parties: the Polish Socialist Party, the Peasant Party, the National Party, and the Polish Worker’s Party. Along with the Polish civilian partisans and the Jewish partisans hiding in the forests, there were also escaped Russian Prisoners of War, who would sometimes shoot the Jewish partisans. Although Poland had been conquered, within a month after the country was invaded, by the joint effort of the Germans and the Russians, guerrilla warfare continued in Poland until the Germans finally surrendered to the Allies in May 1945. The bodies of the victims of the massacre at Majdanek were burned near the ditches on pyres formed from old truck chassis, and the ashes were thrown onto the compost pile behind the clothing warehouse barracks, which now hold the tourist exhibits. It is these ashes of the massacre victims which have now been given a place of honor in the Mausoleum. One of my most favorite TV shows is the series entitled Bones, which is currently in its 11th season. The series is loosely based on the life and writings of novelist and forensic anthropologist Dr. Kathy Reichs. Reruns of the show are on TV and I like to watch them over and over again. Yesterday, I watched an old show which featured a crime that had occurred in Argentina. On this show, Zyklon-B was mentioned. The main character in the show, who has the nickname Bones, is a genius who literally knows everything. As soon as she learns that Zyklon-B was found on some bones, she knows that this is somehow related to the Nazi concentration camps. On the Bones TV show, it was mentioned that a man named Haus (House) was involved in the crime. In the show, Haus was the Commandant of the concentration camp called Majdanek. The Majdanek concentration camp, in the Polish city of Lubin, was in operation from October 1, 1941 to July 23, 1944 when it was liberated by soldiers of the Soviet Union. The old photograph above shows the original main entrance into the Majdanek concentration camp. On either side of the gate, there were sentry boxes, painted with black and white chevron stripes. Although there doesn’t seem to be much security at this gate, the interior of the camp was divided into fields or compounds, each surrounded by a double row of barbed wire fencing. During a commercial on the Bones TV show, I rushed to my computer and looked up the names of all the commandants at Majdanek. The names of the commandants at Majdanek were Karl Otto Koch, Max August Koegel, Hermann Florstedt, Martin Gottfried Weiss, and Arthur Liebehenschel. 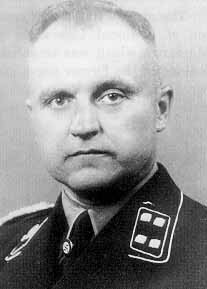 Pictured above is Karl Otto Koch, the first Commandant of the Majdanek camp. Koch had previously been the Commandant of Buchenwald, but he was sent to Majdanek as punishment after he was arrested in Weimar for non-payment of taxes. In 1943, Koch was brought back to Weimar and put on trial by SS Judge Georg Konrad Morgen on charges of ordering the murder of two prisoners at Buchenwald and taking bribes from Jewish prisoners. He was convicted and executed by the Nazis before the end of the war. In the Bones episode, a former commandant of Majdanek is still alive, and living in Argentina, but he can’t be extradited for trial. On the Bones show, it is discovered that a skeleton found in Argentina has traces of Zyklon-B which was used in the Nazi camps. I give the Bones producers a lot of credit for doing a show featuring Zyklon B and the Majdanek camp. I am sure that I was not the only person who rushed to a computer to look up the facts. 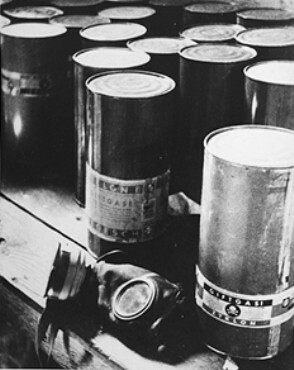 Zyklon b was the trade name of a pesticide invented in Germany in the early 1920s. It conisted (sic) of hydrogen cynaide (prussic acid)…. According to the Majdanek museum guidebook, the camp was initially called the Concentration Camp at Lublin (Konzentrationslager Lublin); then the name was changed to Prisoner of War Camp at Lublin (Kriegsgefangenenlager der Waffen-SS Lublin), but in Feb. 1943, the name reverted back to Concentration Camp. Throughout its existence, Majdanek received transports of Prisoners of War, including a few Americans. Mass transports of Jews began arriving at the Majdanek camp, beginning in April 1942, during the same time period that the Auschwitz II camp, which was originally a POW camp for Soviet soldiers, was being converted into an extermination camp for Jews.